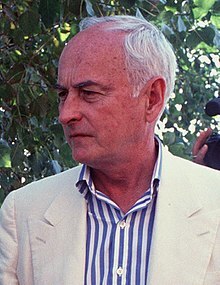 James Francis Ivory (born June 7, 1928) is an American movie director, producer, and screenwriter. For his work on Call Me by Your Name (2017), Ivory won awards from the Academy Awards, British Academy of Film and Television Arts, Writers Guild of America, the Critics' Choice Awards and the Scripter Awards, among others. For winning the Oscar and BAFTA, Ivory became the oldest-ever winner in any category for both award shows. ↑ "2018 BAFTA Awards backstage: James Ivory ('Call Me By Your Name') on his way to making Oscar history". Goldderby. 2018-02-18. This page was last changed on 1 December 2018, at 01:30.